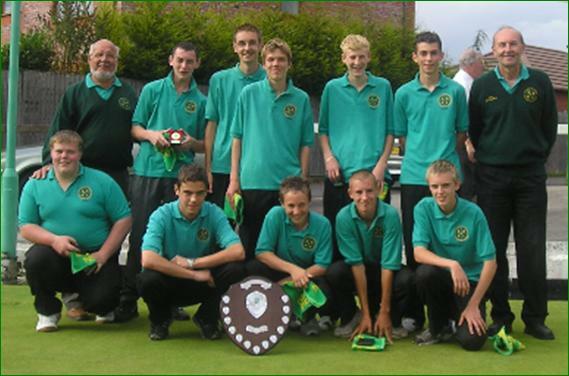 By finishing as Runners-up in their section the Potteries County Juniors qualified to play in the 2005 "Drakes Pride Junior County Supplementary Competition". A squad of 10, representing the Potteries and District, managed to overcome stiff opposition and retain the trophy they had won in 2004. The event was held on 14 August at Longton Village Memorial Sports and Social Club, nr Preston Lancs. 8 Counties took part in the competition. In the preliminary round they were split into 2 groups of 4 and each County played the other teams in their group. In each match 2 points were awarded to the team which had the most winners. The squad were accompanied by Association Secretary, Barry Massey and Keith Williamson, Association President who acted as Team Managers.